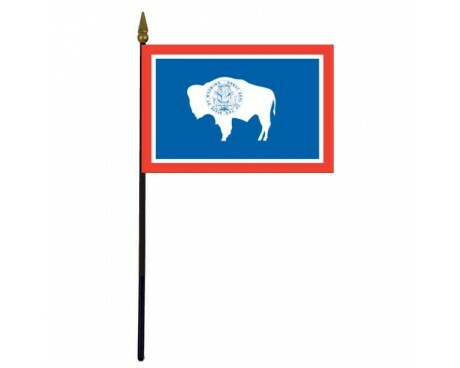 Wyoming State Stick Flag - 4x6"
The state flag of Wyoming includes references to both the state itself and its distinctive wildlife in order to create a flag that embodies every aspect of the state's heritage. The Wyoming flag is one of the few that has not had any legal changes made to its design since it was first adopted, although the flag is not precisely the same as the one that was first proposed to the state government. 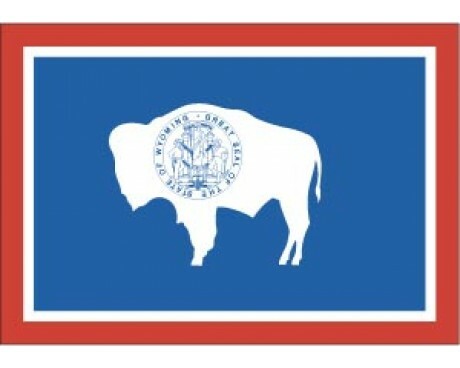 The Wyoming state flag has a blue field that is surrounded by a white border, and that white border has a red border of its own. 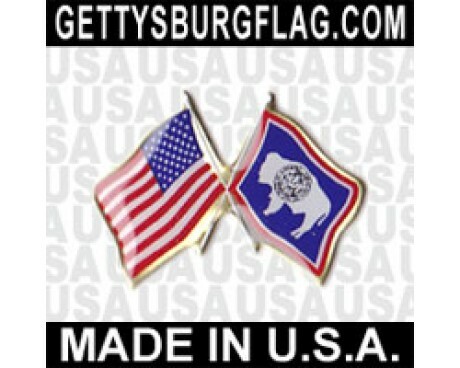 The center of the flag includes a white bison that faces towards the hoist. 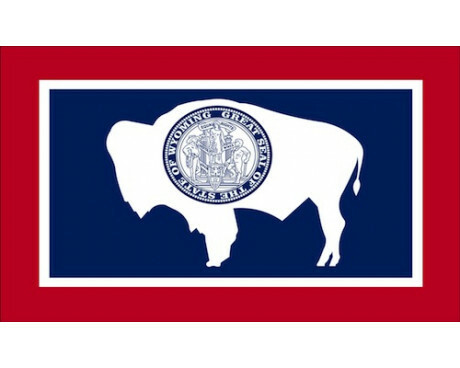 The state seal of Wyoming is proudly displayed on the bison's body. The blue section of the Wyoming flag represents the blue sky, while the white section is meant as a symbol of virtue and purity. The red part of the design represents the blood of both the pioneers and the Native Americans who have died in Wyoming. The bison is a symbol of the state's wildlife, while the seal is a symbol of the state and its government. 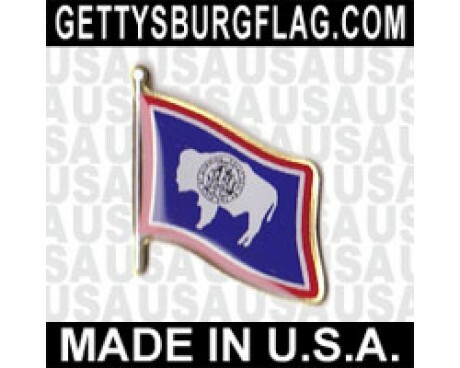 The state seal is placed on the bison's body as a reference to the practice of cattle branding. 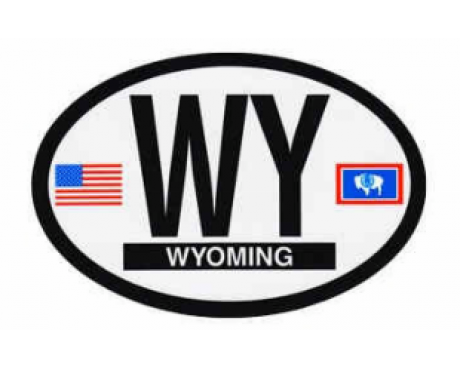 The state flag of Wyoming was designed by Verna Keays in 1916. She submitted her design to a contest that was being sponsored by the Daughters of the American Revolution in order to develop a flag to represent Wyoming, which was one of the few states in the Union that had not adopted a flag by that time. 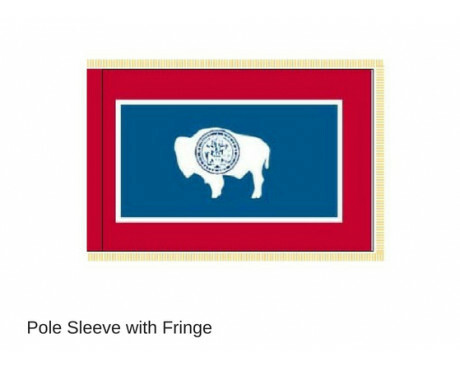 The design was formally authorized for use as the Wyoming state flag by the state's legislature and governor in 1917, but only the first batch of flags adhered to the design. Verna Keays' design had the bison facing the flag's fly as a symbol of the bison's historical freedom to roam across the state, but all of the flags after the first batch have the bison facing the hoist. The change was suggested by Grace Hebard because the vast majority of animals on flags are pointed towards the flag's hoist. The legislature never formally approved the change, but the design is commonly used without any objections.